A delightfully different kind of waffle bowl-thick, fluffy, and tender because it's a real waffle. Just bake and fill for hearty "eat the bowl" breakfasts and delicious desserts. Fill with fried chicken for a delicious hand-held chicken waffle taco. The filling possibilities are endless! Easy to use. Pour in your favorite waffle batter, close the cover, and bake for a 4-inch waffle bowl. No special batter needed. Use store-bought waffle mixes or homemade. Recipes included. Signal light indicates when waffle bowl maker is heated and ready to use. 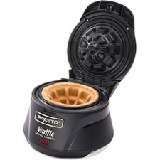 Nonstick grids assure easy removal of baked waffle bowls and easy cleanup.